Alfonso Bialetti in 1933 had the classic stroke of genius looking at the women who did the laundry on the pot boiling on fire: he thought in fact to apply the same principle to the preparation of Coffee. A boiler with boiling water that, by the pressure of its vapor, ascends a duct, then has to pass through a filter containing ground Coffee: this sums up the simple idea drawn up by our moustached Alfonso, whose caricature for decades has been drawn on the Italian coffee pot. That’s how in 1933, in his company specialized in aluminium articles, founded in 1919, Bialetti began producing the mythical coffee pot with the moustached man. Originally 100% aluminium, it is today considered the Italian coffee pot par excellence, especially in the North and Center of Italy. For decades, Moka’s mumbling with boiling Coffee accompanied the awakening of adults preparing for the working day, but also generations of children and teenagers in need of a revitalizing awakening to better face fatigue and school engagements. It happened the same to me! And even today I’ve got the same interest and passion for Moka. 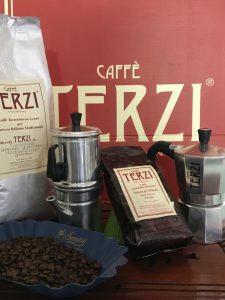 Indeed, I think that Caffè Terzi first defined the parameters for the preparation of a good Moka, in the belief that, putting into effect some simple arrangements, we can achieve results beyond expectations! – After a few moments pour COLD water (two or three spoons) into the coffee pot. Just enough to form a circular “ring” on the bottom. It will be used to absorb the heat of the metal, preventing it from overheating too much and preventing also the first drops of extracted beverage from burning. This will help you to give more pleasantness to Coffee. – When the level of the drink reaches the spout attachment into the coffee pot, remove the Moka from the gas. Thermal inertia will continue the extraction WITHOUT LETTING THE COFFEE BOILING: COFFEE MUST NOT BE ALLOWED TO BOIL! – Wait for 20/30 seconds, then stir and serve the Coffee. The extraction must be fluent and continuous, from the beginning to the end; apart from avoiding the boiling, the spillage of the drink must not splash or suddenly stop. We will have to wash and clean the Moka immediately and every time we use it, by removing all the residues of Coffee all around the coffee pot. Then, we must rinse the Moka, exclusively with warm water and no detergent, and finally mechanically clean with our fingers all sides in contact with the drink, to remove all the oils and colloids that form an greasy film that time after time would tend to oxidize and turn rancid, making the Coffee of next preparations unpleasant.